Kate Worthington feels much like she has had to make a deal with the devil, in this case her scheming mother, to finally get the chance to go to Blackmoore, the summer home of her dearest friends. 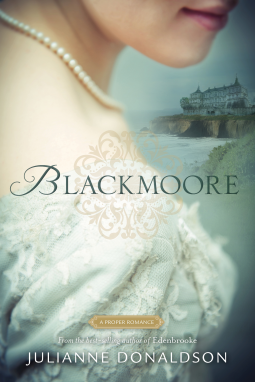 After longing for a chance to see the ocean and moors for years, not to mention escape her embarrassing family and finally go on an adventure, Kate agrees to the impossible to fulfill her hearts desire: gain three proposals while at Blackmoore. But, when Kate arrives at the mysterious mansion built by the sea, she finds that she just might of made an impossible bargain. I was drawn into this story immediately, since it has all the charm of a classic, with more emotion than one usually finds in the classics. With this novel, it was easy to get caught up by Kate's plight as she seeks to figure a way out of her gilded cage while discovering how to find joy in her journey to love, even when things don't turn out how one would expect. I loved this novel! I look forward to reading more of Julianne Donaldson's novels!